Hoarding is an often misunderstood term. Many people apply it to situations that are nothing like hoarding, or they consider hoarding to be far beyond their current situation. In both scenarios all of those involved are hurt by their lack of action and understanding. Tackling a hoarding problem takes self-awareness and a willingness to separate ourselves from our worldly possessions. People who face issues with hoarding need the love and support of their families to understand and overcome these challenges. 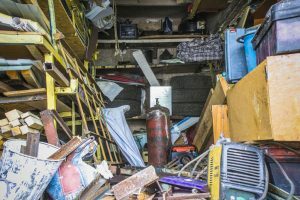 Hoarding is often a symptom of a larger problem and it takes the unconditional love of those closest to use to recognize the problem and address it. How do you recognize hoarding? Oftentimes elders will have a multitude of objects with sentimental value. Their homes are a treasure of memories, reminding them of happy moments in the past. However, this often takes the form of hoarding all possessions, which can quickly overwhelm their space. As the bedrooms are vacated they have more room and the problem grows. This isn’t necessarily their fault, but it takes an outside family member to help them sort and clean. When there are rooms and rooms full of objects, when they have boxes they haven’t opened in years and you can’t walk without tripping over an object, they might have a hoarding problem. If every available space is stuffed with boxes, clothes, and other random objects, your relative might have issues with hoarding. It’s up to you to help them recognize and overcome this problem. However, clutter and hoarding are two different problems. Many people mix up clutter with hoarding and often throw away objects that simply need organization. Clutter can be overcome with smart organization and use of the space. Hoarding is impossible to do anything about without purging some of the useless objects stored in a space. Both require the assistance of caring family. While hoarding and clutter take similar forms, the solutions to each situation are quite different. Depending on the amount of space and monetary funds available, investing in baskets, shelves, and storage bins is a great way to organize and simplify some of the clutter. An efficient use of space is the best solution to clutter and some parts of hoarding. Unfortunately even with smart organization hoarding still requires the removal of many objects. Whether you want to sell them or give them away, the only way to fix a hoarding problem is to remove the excess objects from the space. Work with your family to determine what holds the most sentimental value and what they truly don’t need. If you can filter the useful from the useless you will not only clean the space but have a positive impact on your family member. Oftentimes hoarding is a symptom of a larger problem. Sometimes it’s loneliness, sometimes it’s stress. No matter what the reason, you need to help your family member address the bigger picture. Cleaning up the mess might be like pulling teeth, but unless you try to help them to fix the root cause they’ll never improve and the piles will accumulate again. Hoarding is a mental problem at its root. You need to understand how your relatives are thinking in order to help them tackle the issue. Sometimes it might help to seek out a physician, therapist, or professional organizer. Find the best solution for your situation and remember, it’s not necessarily their fault. They may just need your support to overcome their issue. This entry was posted in Caregivers, Tips and tagged clutter, hoarding, seniors. Bookmark the permalink. Comments are closed, but you can leave a trackback: Trackback URL.